Energy efficiency has come a long way with respect to water heaters. And that’s a good thing given creating hot water is typically the largest energy user in the home after heating and cooling (HVAC). I believe the most important aspect of choosing a water heater is “life-cycle costs.” What does it cost you to own the water heater during the expected life-cycle of the equipment (usually around 12-14 years). The average cost to run a standard 50-gallon water heater using electricity here in Central Virginia is about $420-$450/year; the average cost of electricity in my area is about 10 cents per kWh (average retail price per kilowatt hour for the United States is about 10-11 cents). A heat pump “removes” heat from the air; kind of like a reverse air conditioner (AC unit). Therefore, cold air is vented from the hot water heater while running. Also note that a hot water heater with a heat pump is noisier than a standard hot water heater. Fans need to run to move the air in and out of the unit to extract heat. What this means is the air will become slightly cooler in the room where the hot water heater is located. And the room will be a little bit noisier when the heat pump is running. If you live in a cold climate, consider the hot water heater is pulling heat out of the room that you may be trying to heat. This would be a good thing if you live in a predominately hot climate. See the video below for more info on the hybrid hot water heater running conditions; including a few useful comments on noise levels. Another important consideration is a drain line. Condensation is created by a hybrid hot water heater. Therefore, you’ll need to run a drain line to operate the unit. If you currently have a standard electrical hot water heater in a closet, make sure you can install a drain line before buying a hybrid hot water heater. Based on DOE test procedures, a 50-gallon standard electric tank water heater uses about 4900 kWh per year. According to GE, the GeoSpring hybrid heat pump water heater uses about 1830 kWh per year. In other words, it takes less than 4 years for the GE hybrid to pay for itself compared to a standard water heater. In 12 years, you’ll spend $3,240 less in energy bills (likely even save more given the cost of energy will continue to rise during this time). For those of you living in the United States, you can determine the average electricity rates for your area by visiting the State Electricity Profiles page published by the U.S. Electricity Information Administration (EIA). Another useful resource to calculate potential savings using the GE Hybrid water heater can be found on the GE Appliance website here. Are Solar Water Heaters Worth the Capital Investment? Another thing to consider, the rapid rate of change concerning technology. More than likely we’ll see significant changes in solar technology as well as other energy efficiency technologies during the next 5-10 years. Will the appliances and equipment you buy today be practically obsolete 5-10 years from now? Even though the water heater you purchased just 6-8 years ago works fine, is it worth replacing because you’ll save money within the next five years? Thinking about the future of technology is often missing from “green” recommendations when it comes to ROI and energy efficiency. There are numerous short-sighted recommendations on several of the most coveted “green” advice websites so be forewarned. Since we don’t have access to natural gas, I don’t believe a tankless water heater is right for us (I could be wrong). As the typical water heaters become more and more energy efficient, the use of “electric” tankless water heaters becomes questionable IMHO. The answer really depends on how much hot water you use daily on average – the more hot water you use, the less you get back in energy savings with tankless hot water heaters, in general. Whether you’re replacing an obsolete water heater or looking for the best model for a new house you’re building, it pays to do your homework. Follow these steps to learn more; often you can substantially reduce your energy use simply through water conservation. NOTE: ACEEE does not make recommendations regarding specific water heater manufacturers. Water Heater Rebates and Tax Incentives: visit the Database of State Incentives for Renewables & Efficiency (DSIRE) website to see if you qualify for tax credits or rebates for buying a water heater. The GE GeoSpring hybrid heat pump water heater (HPWH) was found to perform well in a battery of tests designed to investigate its ability to meet user demands in realistic installation conditions while significantly reducing energy consumption. Good agreement between calculated energy factors (EF) obtained from Advanced Energy’s testing and corresponding values published by the Department of Energy’s (DOE) and the Environmental Protection Agency’s (EPA) ENERGY STAR® rating system were obtained. Some reduction in water delivery temperature below the set point was measured in certain operational modes but none that appear to keep the hot water heater from acceptable performance in real-world conditions. Key findings from Advanced Energy’s testing are. . . (visit the report site here to continue reading). NOTE: The North Carolina Advanced Energy Corporation is a registered engineering firm with the North Carolina Board of Examiners for Engineers and Surveyors. This report was prepared under the responsible charge of a Professional Engineer. MAINTENANCE TIP (assuming you have a water heater with a storage tank): I learned this tip a few years ago and I frequently see it on blogs now: Every other month or so, attached a garden hose to the drain valve that is located at the bottom of your water heater tank. Remove a few gallons of water which will contain any sediment (mineral deposits such as calcium, etc.) that settles to the bottom of the tank. This simple maintenance procedure will extend the life of any water heater that uses a tank. Let me know if you have any experience with either. Thanks. 6 Comments on "Choosing the Best Energy Efficient Water Heater"
Thanks for sharing the information. I am contemplating the purchase of a hybrid water heater to replace one that has seen better days. I noticed the GE Water Heater is on sale now for $999 at Lowes and Sears. Is that a good price? That is the best price for the GE Hybrid we’ve seen so far. Not too long ago it was selling for $1,400. At $999 you may find it pays for itself in 3-4 years depending on your usage. Another way to save a few bucks on your water heater purchase is to use one of the credit card sites. How? For example, Discover Card provides a 5% to 20% Cashback Bonus for online purchases with over 175 top retailers, including Sears. The “cash back” bonus right now for Sears is 10% through the Discover website. Assuming you have a Discover card, all you do is login to your online Discover account and “Shop Discover” – choose the Sears link from the list of Shop Discover retailers while you are logged into your account. It will take you to the Sears website – purchase the Hot Water Heater for $999 and you’ll receive a cash back bonus from Discover for $99. 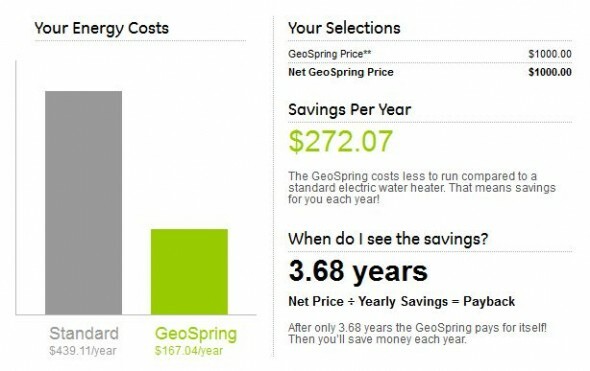 As a result, the GE GeoSpring Hybrid Water Heater will cost you $900 (plus the usual tax, delivery, etc.). The last time I checked the cash back bonus offer for Lowes is 5% (again, through Discover). I believe several credit card companies offer similar cash back offers for retailers. I hope this helps. You may want to view the comments from my visitors too. It seems that there are some serious poor performance, high maintenance, and bad quality issues with the GE hybrid water heater. Thanks for the comment. While researching I too found there were some issues with the first generation model of the GE hybrid water heater. It appears they improved the performance and worked out some of the glitches with the second generation, etc. Another good reason to be weary of first generation technology. Often the engineers get it right but production doesn’t (or vice versa). On another note: product owners tend to go out of his or her way to find outlets to complain about a product when something goes wrong; this isn’t always the case with folks that never experience any issues with the product. For example, I checked the product reviews on Lowes’ website: 93 out of 123 reviewers recommend the product and the Sear’s website where 8 out of 10 recommend the product (at the time I checked) – it looks like the first generation water heater in the product photo (the new one is red). WRT “colder climates” I agree it may not be the right choice for many. In Central Virginia we get more warm days than cold days. Also, you can be creative and vent the “cool dry air” to a vent located near the top of your refrigerator which is putting out excess heat or into a conditioned crawl space that likes “dry” air. UPDATE: We purchased and installed the GE GeoSpring Hybrid water heater. So far, works as advertised. No problems whatsoever powering it up. It definitely cools the room when in hybrid mode. We put it in a mud-room; the room includes dog beds and a concrete floor. Given it is freezing outside, we are currently operating it in electric mode. However, earlier this month we had unusually warm days for January so I switch to hybrid mode during the day and switched back to electric mode at night. It is really easy to switch modes and change the temperature setting. Also, when we went out of town for a few days, I easily switched the unit to “vacation” mode; this wasn’t practical with our old water heater. I’m sure we are saving a lot of energy with the GeoSpring Hybrid. Noise isn’t an issue when the hot water heater runs in hybrid mode but we have it in a mud-room. You can’t hear it running in any other room – more than acceptable noise level in our situation. Even when in the room, the noise doesn’t seem to be annoying at all – again, acceptable noise level. It is going to be hard to determine the actual energy savings for us. Our previous water heater was in a utility room, which was outside basically (insulated room but unconditioned space; no heating or cooling). Given the previous location of our water heater, I expect our payback period to be 3 years or less given where we now have the GeoSpring. Cooling of the mud-room in the summer is going to be a bonus for sure; the room faces south and gets pretty warm in the hot summers here in Central VA.
After a year of owning the GE Hybrid Water Heater, we are saving money on our electric bills. Also, the unit has performed flawlessly to date; no issues whatsoever. The water heater has been installed inside the home (mud room) so we run the unit in “electric” mode during the winter months. We also operate the unit with a reduced temperature given it produces plenty of hot water at the lower temperatures.